Founded in 1956, Antarctica's Halley Research Station achieved notoriety in 1985 when scientists there first discovered that the ozone layer, which provides critical protection from ultraviolet radiation, had been decreasing from 1975-1985. (Two years later, NOAA's Susan Solomon and a team of scientists working at McMurdo Station in Antarctica were the first to assert that chemicals from degrading chlorofluorocarbons were the cause of the damage.) Today, the British-operated Halley remains an important scientific research station for atmospheric sciences, geology, and glaciology. But to logisticians like us, among the most interesting ongoing projects at Halley is the construction of Halley VI, a new station that will consist of eight modules connected together to form a long, train-like structure and will all be mobile (more on that later). Like those in Antarctica, our field stations in the Arctic experience extremely harsh weather, and the ability to easily lift and move structures is much appreciated. As snow gathers around the buildings' legs, we spend a considerable amount of time lifting the structures and keeping the snow from overtaking them. Consequently, we're very interested in the building of Halley VI. Seven of the modules will contain sleeping, support, energy-generation, and science facilities. The eighth module will host a living area, dining room, gym, and kitchen and will be double height. Providing year-round living and research quarters to up to 70 people in the summer and about 16 in the winter, the new buildings are straight out of a science fiction movie. 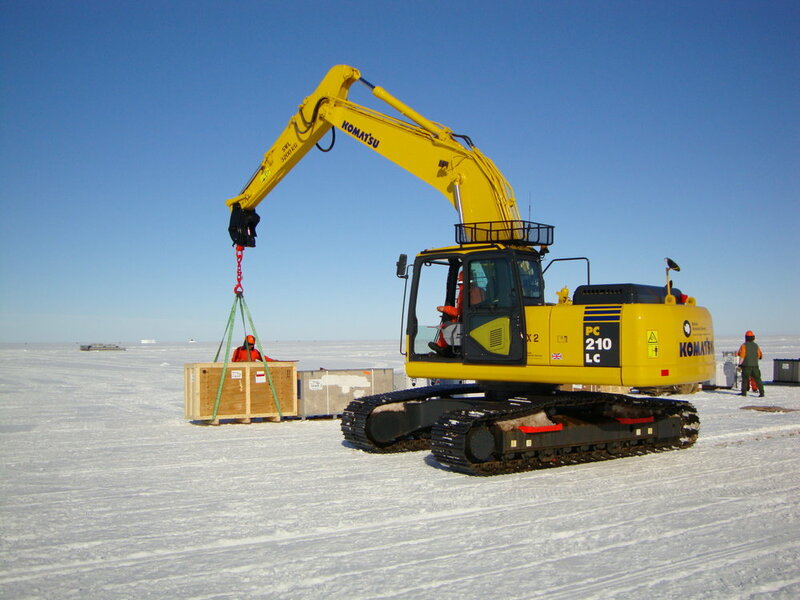 The modules have arrived in Antarctica where they are being assembled and will later be moved to the site. • Reduced annual maintenance, made feasible in part with computer-controlled hydraulic rams to jack up the buildings without significant labor. • Relocation of the melt tank to the surface so it can be filled mechanically by bulldozer.